As the clock ticks before my departure back to England I wanted to explore the city of Enshi, Hubei. Inspired by two fellow teaching friends I booked up without any hesitations. With a limited time frame I had to be inventive, would I spend the day at the Grand Canyon or choose the city centre? Would the soft sleeper to Enshi be more comfortable than my Tibet train? Oh! Clocking off from another week teaching English in Wuhan, I got myself through Friday rush hour traffic to Wuchang Railway Station in one piece. Since Emmy and Jemima had uploaded their postcard worthy photos of Enshi city I had to see those lush sights for myself! Bagging a soft sleeper seemed like the right thing to do, I'm used to sleeping in hotel dormitories but that train compartment just didn't feel good compared to the more simple hard sleeper compartments that are much less private. Leaving a very rainy Wuchang I slept pretty well till six in the morning, prepared for the arrival of my train it wasn't meant to be. Due to a line problem my train was stationery for at least two hours of that I was aware of, finally chugging away at 9am it took us another two hours to reach Enshi Railway Station. Shrugging away that drama the views from that train were out of this world amazing! Oh my, that rain was so bad! Jumping off that delayed sleeper train I had considerably less time than I had hoped for, getting my sightseeing game on I jumped on the 30 bus to Tusi Ancient City. An oasis of lush green loveliness I got on with what I had to do, surrounded by a stone wall I unknowingly made my way to the top. The views over the ancient city were something else. 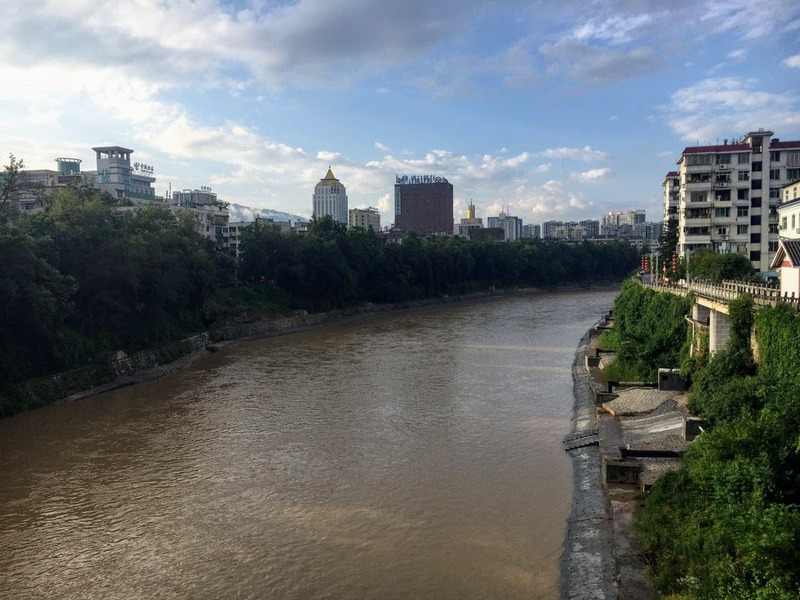 Enshi was shaping up pretty nice, resembling a 'Little Chongqing' with its long hanging clouds and humid climbs amongst the mountainous scenery. I can't remember all of the names but the structures certainly served a special quality, dating back to a time when a minority clan called the ancient city their dominion, it felt like another world completely. The concrete style of my Wuhan neighbourhood was long gone, far off east back in the provinces capital. That's it! During 910 of the Later Liang Dynasty that Tusi Domain embodied true Tujia style! The annoyance of the later arrival had left me, Enshi had a plan for me, I was good E! No, I wasn't up for cramming onto a bus for twelve stops! Where's Baidu Maps?! Getting all clever I decided to take a diversion from my Baidu Maps route, the rain might of been battering Wuhan but Enshi's Qinjiang riverside wasn't looking bad, hold on let me take that back quick-time! My did it throw it down, literally I had never seen such a severe monsoon style rain. To cut a long and rather unpleasant story, I thanked the heavens as soon as the rain ceased, credit to mother nature she ushered in a beautiful mid-afternoon sky over the Qinjiang River once I had got my directions back on track. Enshi sure had me on my toes, getting me to this city late and soaking me beyond belief, something honestly had to give! Putting things into perspective I had made it to my third city in Hubei within my first two years of being in Wuhan, China, aside from my other travels it was good to be discovering more in Hubei. Let's go Enshi! 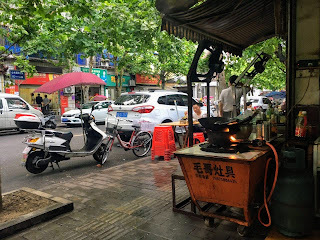 Coming to the end of my time here in China for the first throw I had just had my final official National Holiday at the end of May 2017 to Hefei, but I wanted to take three final weekend trips to cities that were within easy reach from Wuhan. Enshi is famous for its magical Grand Canyon but with no more than a weekend free from Friday evening to Sunday afternoon I had to decide 'city centre' or 'Grand Canyon?' 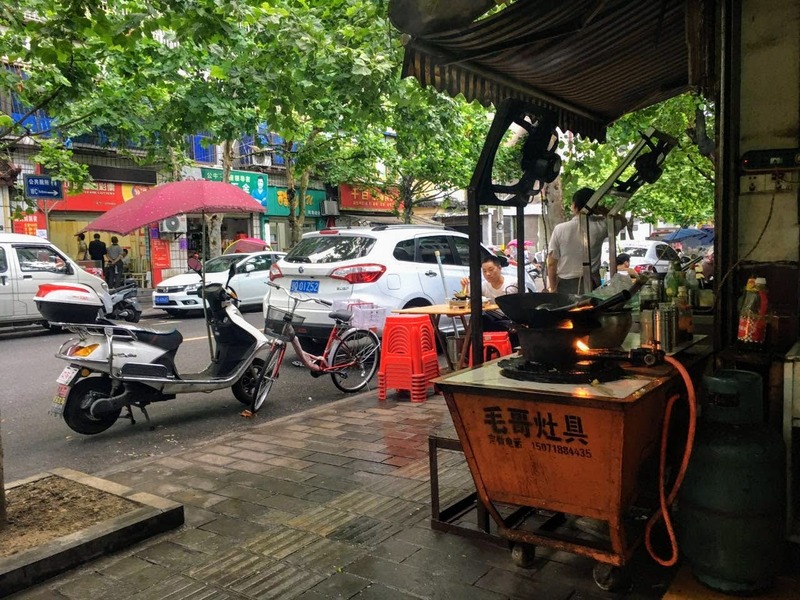 The city centre served me a compact series of sights that were on a lower level compared to Wuhan, lower in the stakes of being accessible by foot and with less going on the pollution didn't throw up any issues. Enshi's city centre core had a close-knit vibe, everything was where it needed to be and what I had seen was really nice, a change of scenery was what I was looking for and I got that! Growing close to my Dongfeng Avenue hotel I saw what looked like the Fenghuang Mountain Park, knowing I wouldn't have the time to visit, that was fine. Enshi was so chilled out! Checking into my lodgings for the night, I chose the Enshi International Hotel and being a smaller city in Hubei Province I wasn't expecting too much. Serving a purpose and with a clean room it was money well spent, I hadn't gone all the way to Enshi to spend the evening in the room so I went out looking for some food. Backtracking to the almost flooded streets I had seen from the bus I chose to have a walk back in-search of something to eat. After a bit of wandering I found a simple looking road-side restaurant, the lady was frying up some fried rice that looked amazing! Choosing a bowl of that delicious fried rice was a winner, the place being simple gave me a perfect sense of Enshi's enchanting charms. The dusk began to fall onto that normal Enshi street, people chatted on the pavements at the other food places in the evenings afterglow. Aside from whatever rubbish had happened didn't matter anymore! Breathe! Enchanted? From one moment to the next my experiences in Enshi went from an enchanted moment to a nightmare, without a doubt the beauty and charm of Enshi showed me something enchanted without question! The rolling mountains that I saw on the approach into Enshi definitely looked dreamy, regardless of the lush surroundings it did make the delayed arrival a nightmare because I wasn't in a place to extend or repeat my trip. Seeing the rain off it was definitely a place that took me away from my final weeks at work, I have my arrival back into England on my mind so these small weekend getaways distract me or well that's the plan anyhow. The Grand Canyon may have to be for next time but all that I saw was well worth the questionable sleeper train and the less than desirable summer showers. Mentioning the rain a few too many time I'll leave this here now with the charm of Enshi that I loved! Thanks Emmy and Jemima for inspiring my trip to Enshi! Yichang, you ready? !